Nestled along the Santa Fe River, in Santa Fe, New Mexico, residences for sale along Alameda Street have a lot to offer. Homes for sale in this river corridor include single-family homes, condos, and townhomes of varying styles and sizes. Therefore, you are certain to find something that suits your personal preferences and budget. Available properties along Alameda are ready to impress you, so now is the time to consider what it would be like to call this river corridor home. When you choose to live in this area, you will have plentiful entertainment opportunities at your fingertips. For example, if you like spending time outdoors, then you will appreciate the pleasant parks in the area, such as the Santa Fe River Park or De Vargas Park. Relaxing strolls and delicious picnic lunches can become part of your everyday life. As a resident of the Alameda area, you will also appreciate plentiful cultural attractions in the vicinity. Santa Fe has earned its reputation as an arts hub, so you will have a wide variety of attractions to consider. Attend a captivating live performance at the Santa Fe Opera, tour the Georgia O’Keeffe Museum, or attend a local festival that celebrates music. The Santa Fe Farmers Market is also an excellent place to spend time, and the famed Santa Fe Plaza is certain to host events that will pique your interest. You may also choose to travel approximately an hour south to New Mexico’s largest city, Albuquerque. This city is rich with history, so you can easily learn about the area’s heritage. Whether you are strolling in a park, appreciating artwork, or learning about history, you will be content to think of your lovely single-family home, condo, or townhome along Alameda Street in Santa Fe awaiting your return. Gorgeous natural scenery, beautiful residences, and plentiful entertainment opportunities are only a few examples of what you can expect from this river corridor. Single-family homes, condos, and townhomes for sale along Alameda Street are ready for your consideration. 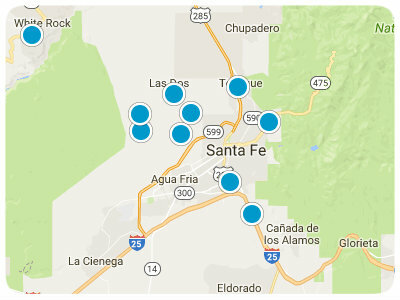 If you are ready for more information regarding fabulous real estate options along Alameda Street in Santa Fe, please do not hesitate to contact us.